Shon Whitney has created a new range of custom lightsabers called Kyberlight which have this week launched via Kickstarter to raise the $50,000 they require to take the awesome creations into production. The range includes 20 built-in colours as well as a lifetime warranty on the blade, and all are fitted with rich sound effects as well as affordable pricing allowing you to make your perfect cosplay weapon. Check out the video below to learn more about the Kyberlight custom lightsaber range and their construction as well as all the options that are available to choose from. The creators explain little more about the inspiration and design. As long time obsessed Star Wars fans with engineering backgrounds, we set out to engineer the world’s greatest combat ready, custom lightsaber. As we looked around the world of custom sabers we felt there was huge opportunity for someone to really do it right. 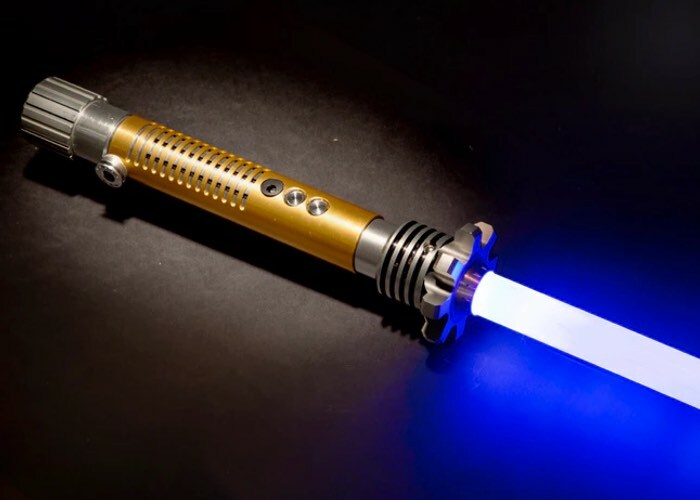 To not only create a high quality custom lightsaber that’s durable and built to last, but also to make it affordable and quickly available for fans of all ages anywhere in the world. And that’s exactly what we did when we created Kyberlight. 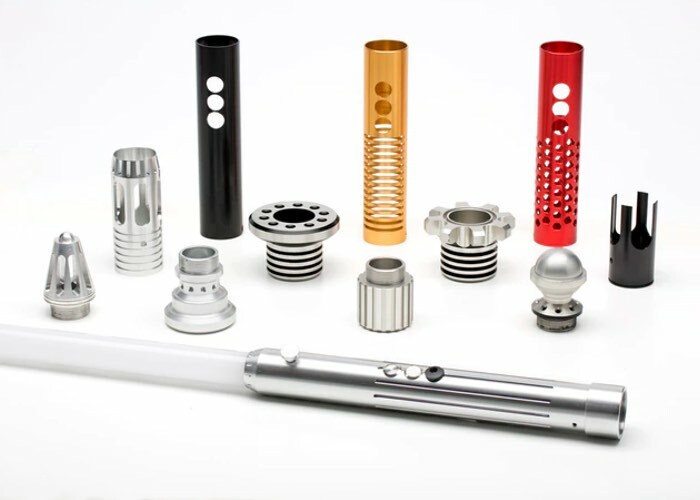 1- Hilt Customization – Custom machined from 7075 aircraft grade aluminum, each Kyberlight hilt comes ready for complete customization. The screw off bottom, top and middle overlay, allow you to mix and match the accessories to make the perfect lightsaber for you. Kyberlight offers a starter accessory kit that comes with 12 different accessory options, giving you countless custom combinations to choose from. The long term plan is to offer a new custom accessory item each month so you can continue to expand your collection. 2- Select from 20 built-in colors at the touch of a button – Using cutting-edge and proprietary LED technology, each Kyberlight saber allows you to toggle between 20 built-in colors with the simple touch of a button. No one else has that capability except Kyberlight thanks to a completely new approach to the LED technology. In addition to its on-demand color customization options, the Kyberlight LED technology also puts out over 320 lumens, making it the brightest lightsaber in the galaxy. We also designed a custom housing for the Kyberlight LED made with gorilla glass to ensure durability for fighting. One bright lightsaber with 20 built-in colors! 3- Indestructible – These custom lightsabers aren’t just for show, they were designed with combat in mind. Our goal was to make these fully fightable and built to last. Guaranteed! And we back it up with a lifetime warranty on every Kyberlight blade. With its sleek and futuristic design, the Kyberlight saber blade is made from a proprietary plastic blend making it virtually indestructible. If you break it for any reason, we’ll replace it free of charge. What good is a lightsaber if you can’t fight hard with it? 4- Sound Effects – Another unique feature that comes standard with every Kyberlight saber, is the rich quality stereo sound effects (including flash on clash). With a proprietary sound card, this high quality sound system really helps create the ultimate lightsaber fighting experience. For more information on the new Kyberlight custom lightsaber range jump over to the Kickstarter website for details by following the link below.